On my drive to the Road to Tara Museum, the closer I drew to my destination, the more frequently I saw the word "Tara" on business signs, street signs, residential complexes... seriously, I think I saw "Tara" more times on a single spoke of road leading to the Museum than is mentioned in the book. It seemed that way, at least. Why Jonesboro and not Atlanta, you ask? In Gone With the Wind, the Tara Plantation was set in Clayton County...specifically in Jonesboro, Georgia. And in 1969, Stephens Mitchell, brother of the Pulitzer Prize winning Margaret Mitchell, proclaimed Clayton County "the Official Home of Gone With the Wind." You can imagine how proud Jonesboro citizen are. 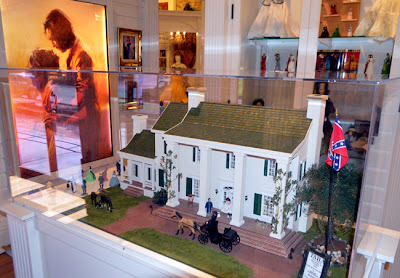 The model above was built by Gone With the Wind enthusiast Dorothy Friedenreich. It took three years to build and lights in every room work and there's a cutaway on the back so you can see into each room. This is one of the best Tara models I've ever seen! Alright, let me back up. 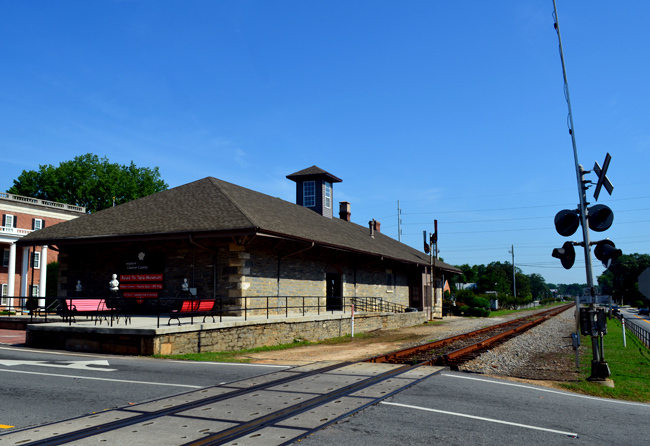 The Road to Tara Museum is housed in an 1867 historic train depot, which is deceptively larger inside than you would think. 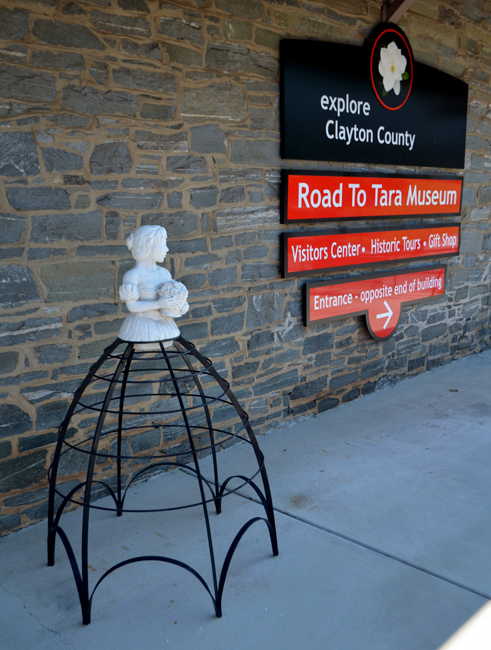 Originally, the Road to Tara Museum opened in 1993, then moved to the depot in 2000. 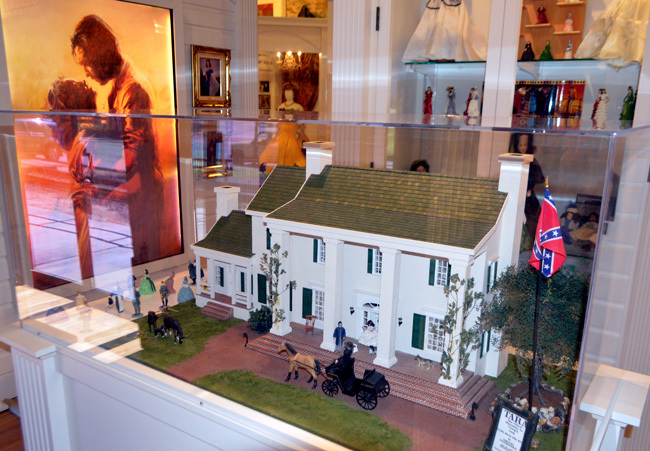 The Museum's collection today is a combination of the Museum's and Gone With the Wind aficionado Herb Bridges' collections. 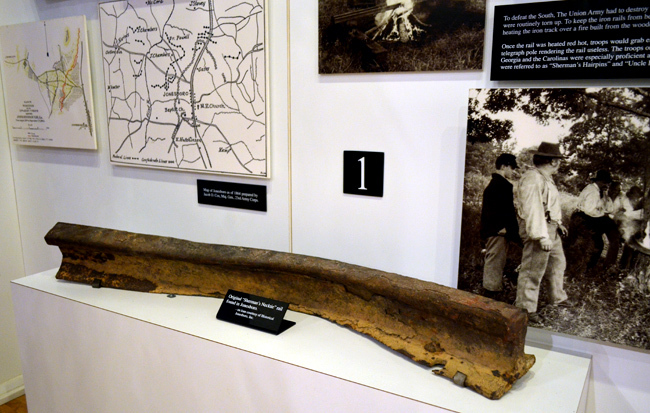 The Museum is flanked by Civil War artifacts and displays. The artifact in the above photo particularly fascinated me. "Sherman's neckties" were named for General Sherman whose soldiers would heat sections of rail until they could be bent and twisted around trees, rendering the sections useless. 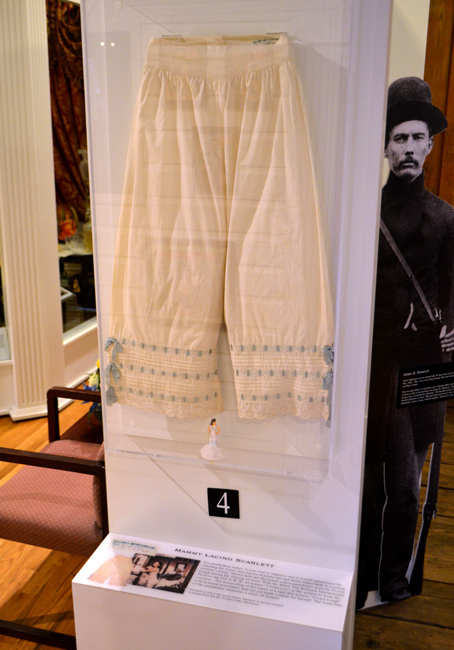 One of the more fun artifacts in the Museum—and it's not a replica—is the pantalettes that Vivien Leigh wore in the movie. Arguably one of the most memorable scenes of the film, Mammy, rather forcefully, pulls taught the pantalettes on Scarlett O'Hara, who is holding on to a bedpost for dear life. The things women go through to look attractive! Surely you've figured out by now that I'm only giving you highlights of the Museum...there's way, way too much to tell about all of it. I'd say there's so much you could write a book about it, but that's the reason we're here, right? I know, I know...I couldn't resist. 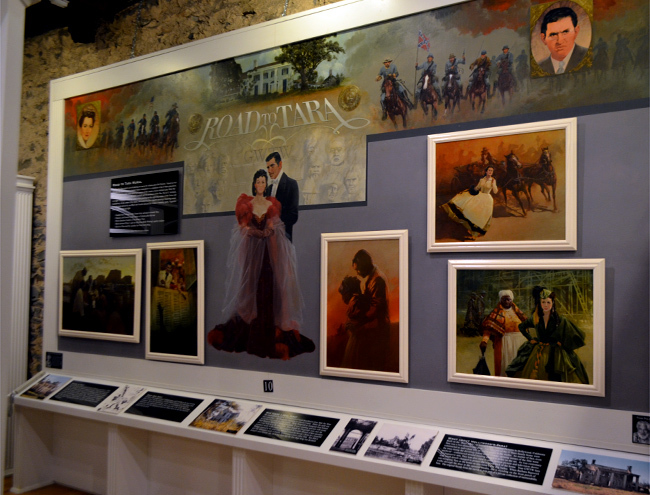 The above 16' by 8' Road to Tara mural is an original oil by Atlanta artist Del Nichols. In the upper corners there are portraits of Margaret Mitchell and David O. Selznick, and somewhere in the painting is also rendering of Elvis Presley! Nichols is known to be something of a fun sort. 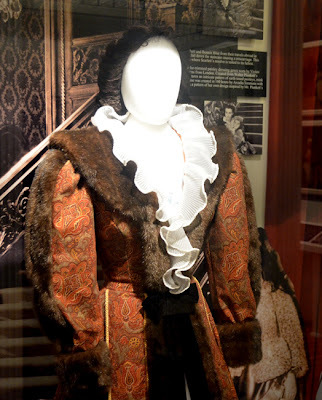 Among the Museum's impressive collection are a lot of different dresses from the movie, many created by the Road to Tara Costume Guild, some even crafted from original plans. Some of the dresses include the famous Green Drapery Dress, the Burgundy Dress, the Fur-trimmed Dressing Gown, Bonnie Blue's Riding Habit, and several others. So, in addition to being a destination that pleases Windies, Civil War buffs, and history fans, it's also great for fashion enthusiasts. 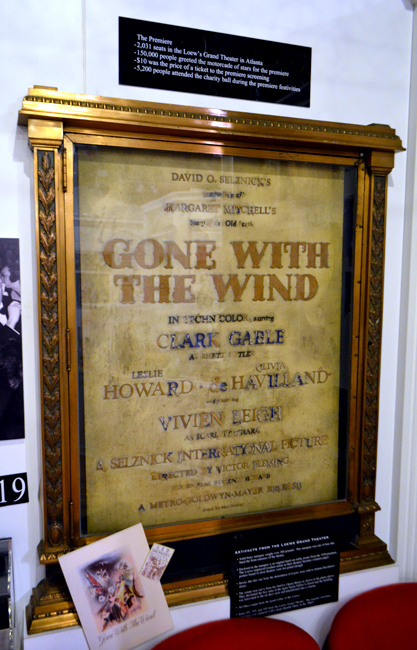 There are quite a few remarkable artifacts in this Museum—every Gone With the Wind enthusiast will be grateful for having visited. One of my absolute favorites is what was one of only four 200-pound brass marquees that graced the front of the Loew's Grand Theatre where Gone With the Wind premiered on December 15, 1939. Today, the Georgia-Pacific Building stands where the Loew's stood until 1978. From the Loew's there are also some theatre chairs, carpet panels, railing, and one of the remnant bricks from the demolition of the Theatre. As the second best-selling book in the world and one of the most-viewed movies of all time, there is an incomprehensible amount of merchandising...some of it licensed, some of it not. 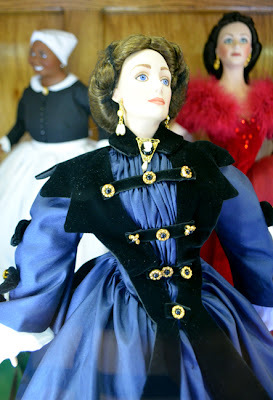 The Road to Tara Museum has quite a bit on view, including more Gone With the Wind dolls than I've ever seen! It's a collector's cornucopia of themed dolls—featuring all the major personalities from the book. I totally enjoyed my visit to the Road to Tara Museum. The Museum staff were hospitable and welcoming and quite knowledgeable about the book, Jonesboro, and the Museum. That doesn't always happen. I totally recommend a visit...and check out the other nearby tourist destinations! I have always wanted to visit this museum since finding out about it years ago. I plan to be in the area soon but the museum hours may not be condusive to my schedule. I read the novel 5* when I discovered it in my teens! Where visitors at one time allowed to pose in the period costumes there, particularly as Scarlett O'Hara? I hope you can make it there when you visit! It's a fantastic museum. Check their website for hours...I wrote that article a couple of years ago, but have been back many times. I don't know of any costumes the museum has that visitors can wear, but they have had Scarlett and Rhett there on special occasions and I was excited to one time have my photo made with them: http://www.wanderlustatlanta.com/2013/11/an-evening-with-rhett-scarlett.html Do let me know if you make it an what you think about the museum.